A local Ho-Chunk woman’s career will be decided with the November General Election. 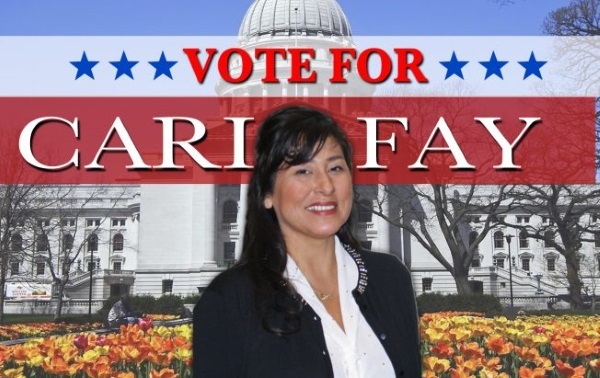 Cari Fay, a town of Manchester resident and a contract health services assistant administrator and mediator for Ho-Chunk Nation Department of Health, is challenging Republican incumbent Nancy VanderMeer of Tomah in the 70th Assembly District. She is running as a Democrat and incumbent VanderMeer is running as a Republican who is seeking her third two-year term. The 70th District includes northwestern Portage County, a majority of Wood County, eastern Jackson County, and northern Monroe County, which includes the cities of Tomah and Sparta. Cari is a United States Marine Corps veteran, was a Milwaukee police officer for 10 years, was an investigator for nine years, and is a certified mediator and trainer for creating settlement agreements. She wrote a resolution for the Rights of Nature and created policies and procedures to ensure laws are followed correctly. Her political platform has been clearly established. “It’s water, healthcare, education, a living wage with benefits, and road repair. There are so many things we need to be reinvested in,” Cari said. “My main emphasis is on the environment because those environmental laws keep getting lowered for these companies coming into the state of Wisconsin. It should be reversed,” she said. Cari’s passion is saving natural resources. She’s been working on environmental issues with the Ho-Chunk Nation for a number of years. “There were changes that needed to be made within the Nation, taking steps toward going green, such as using solar energy and using the declaration of extraterritoriality that is consistently being reviewed,” she said. “I’m constantly asking, ‘Where are we at with this?’ If this declaration of extraterritoriality was advocated and pushed forward down in Washington D.C., and it was approved through international law, then the state would have to follow that resolution. It basically states that anything within a 60-mile radius of Ho-Chunk tribal trust land, any type of sand mines, they would have to stop, shut down those sand mines,” she said. That declaration was written by Dr. Jeremy Rockman and Cecelia Krause and was voted upon in General Council and was passed. She’s also a strong advocate for education and she wants to repeal Act 10, which is the act that abolished teachers’ union bargaining. The program doesn’t have to be just for public service, she said. It could be for any businesses that want to be in the program. “That’s just a dream, a vision, that I have. We want our kids to stay here and come back to the communities and to share their skills, their knowledge. We don’t need them getting an education and going to a different state because wages are higher benefits,” Cari said. Another issue on her political platform is healthcare. Healthcare is an important issue for all state residents and she is an advocate for expanding BadgerCare. She believes the cost will go down as more people become enrolled in the program. “It’s supply and demand. If you have a lot of people wanting something, like health insurance, and they all switch over from the marketplace to BadgerCare, then the insurance premiums would go down,” she said. “I strongly support providing the medical and mental health access for the issues veterans are facing and transitioning from military life to civilian life,” Cari said. Another issue is our state’s crumbling roads and bridges with no way to fund repairs. She believes that funding for road repairs can be accomplished by having larger corporations work with local governments in developing a plan for funding road repairs and bridge restoration. “For the goods and services they provide to the communities, statewide and nationally, you would think that their customers would want to travel on nice roads to their businesses. That’s the thing - everyone needs to work together. There are going to be times when people are going to have to agree to disagree and not everyone is going to be happy 100 percent. At least there will be some happiness where baby steps will be taken towards the same goal without going to the extremes,” she said. “I definitely would advocate for the roads in District 70 to get fixed because there is a lot that is in desperate need - or they aren’t even paved because there is no money to pave them,” Cari said. Cari has been working hard to get out her messages and to gain support for the upcoming election, hoping to garnish more votes than her opponent. She has been in parades, walking through neighborhoods and knocking on doors. Working in the public sector hasn’t always been her ambition, but as issues became more important to her, she wanted to be the advocate of change. During her run for county board supervisor, Cari had visited every door in the district, more than 300 doors, she said. However, her political ambitions didn’t end there. “I was going to run for Assembly in District 92 (parts of Jackson, Trempealeau, and Buffalo Counties) this year, but there were already three candidates for the Democratic Party on the ballot,” she said. Now that she lives in the town of Manchester, Jackson County, she decided to run for Assembly in District 70. That district has odd boundaries, extending from Wisconsin Rapids in a dogleg down to Sparta, Tomah, south of Brockway and Kaminski, Pittsville, City Point, Dexterville, and up to the Marathon County border in Wood County. “For a district that big, they should have two people as representatives. A lot of extra effort and time goes into ensuring that I make it to every area and that I get to speak to everyone. I put thousands of miles on my car already just campaigning,” Cari said. One of the major aspects of campaigning is the money it takes to mail information, create yard signs, and gas to visit each resident in each area. She feels grateful for the donations she receives for her campaign, no matter how large or small. “Some people give $5, some people give $20. Some people say ‘This is all I have.’ Something is better than nothing. Every little dollar, five dollars – they all add up,” Cari said. “That was the most difficult thing for me to do is ask for money. If I could pay for this all by myself, I would because I just want the people’s support in voting. And going door to door because its very time consuming,” she said. She has a few dedicated volunteers to help her with the effort. She’s received a lot of support from organized groups. “I am grateful that I have been endorsed by the Sierra Club, Wisconsin League of Conservative Voters, Wisconsin Progress, Citizen Action of Wisconsin, Wisconsin AFL-CIO, AFSCME and National Association of Social Workers,” Cari said. “Also, I would like to remind everyone to vote, as this is their opportunity to ‘Be The Change,’ and ‘Every Vote Counts’” she said.